Gastao Brun and Gustavo Kunze (BRA) won the Practice Race of the 2010 Star World Championship. More importantly, they won the Taca Darke de Mattos, the longest running sailing regatta in South America. Brun/ Kunze had an early lead in light and shifty conditions. Julio Labandeira and Valentin Thompson (ARG) passed them as the shrinking fleet headed back from Copacabana. Labandeira/Thompason lost the lead under the lee of Sugarloaf. 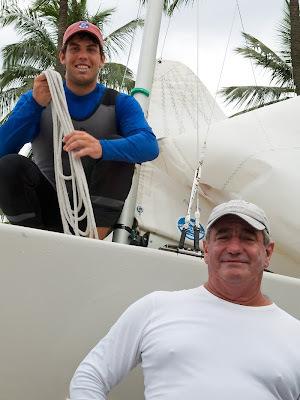 Branislav Erac and Ozren Tosic (SBR) were neck and neck with Labanderia/Thompson as they played the final shifts through the mooring field in front of Rio de Janeiro Yacht Club. The new Serbian crew finished third. The last boat to cross the line, Gerardo Della Torre and Guillermo Latour (ARG) win a very special trophy – a gilded gold shoe with a well-worn heel. Sailing legends have won this cherished trophy in this very traditional race.